Helvellyn is the third highest mountain in the Lake District and a popular favourite, visited by large crowds on a good day. The craggy eastern face tends to keep snow for longer than most other parts of the area, and the route up Striding Edge is used by the weather surveyor in the winter to check the mountain conditions. Like many Lakeland fells Helvellyn is a mountain of two very different halves. To the west are long, steep grassy slopes that drop down to Thirlmere, getting steeper towards the lake. To the east the scene is dominated by cliffs and crags, with a series of impressive coves dominated the scene from Dollywaggon Pike up to Helvellyn. The mountain's most famous feature, Striding Edge, is on this flank, leading almost directly up to the summit. Helvellyn is the highest point on a very long ridge of higher ground, which runs from Dollywaggon Pike in the south to Clough Head in the north, a distance of nearly six miles from summit to summit as the crow flies and all over 2,000 feet. One side effect of this is that Helvellyn itself doesn't really stand out in most views - instead the entire range tends to dominate, and it can sometimes be quite hard to pick out Helvellyn amongst the line of peaks. The most famous routes of ascent are the two eastern edges - Striding Edge and the slightly less fearsome Swirral Edge. I haven't used either of these routes, but I have seen them from above and below and read repeated news reports about walkers who have fallen or been blown off the edges, and thus have absolutely no interest in either one! The walker coming from the east who wants to avoid the edges has two alternatives. The first is to come up Glenridding, use the zigzag path onto Raise, and then follow the path that reaches the summit via Whiteside and Lower Man. The second is to come up Patterdale to Grisedale Tarn, then climb up the flanks of Dollywaggon Pike and follow the main ridge line north to Helvellyn. This is splendid route, with varying scenery, great views of the edges and a series of other fells to 'bag' on the way. The western slopes are steep but less fearsome that the eastern crags, and a number of paths are available, coming up from the shores of Thirlmere. The northernmost route starts at Thirlspot, the southern path starts near the southern end of the lake or it possible to reach Grisedale Tarn from Dunmail Raise and then follow the Dollywaggon Pike route. We have a long walk up Helvellyn that starts in Patterdale village, follows Grisedale to Grisedale Tarn, then follows the ridge to Helvellyn (visiting Dollywaggon Pike, High Crag and Nethermost Pike on the way). The route then drops down the northern ridge of Lower Man, passes over Whiteside Bank then curves east to drop down into Keppel Cove and down Glenridding to Ullswater and back to Patterdale. This is a long but very satisfying walk, with great views of the eastern crags. The summit of Helvellyn is a long ridge (about a fifth of a mile long) that stays fairly level as it runs along the top of the cliffs between Striding Edge and Swirral Edge. The cairn is unimpressive, but there is a wind shelter, and lots of space to spread out on the western slopes. If the wind is coming from the east then there is plenty of shelter to be found by moving a few feet down the western slopes, but if it is coming from the west then the shelter is about it! Each of the eastern coves has its own stream. Nethermostcove Beck marks the dividing line between Helvellyn and Nethermost Pike. Red Tarn Beck comes out of Red Tarn between the edges. Glenridding Beck is born in Brown Cove, to the north of the summit crags. On the west Helvellyn Gill rises in the cove north of Lower Man. and marks the boundary with Whiteside Bank while Whelpside Gill rises below the summit and forms the divide between Helvellyn and Nethermost Pike. Helvellyn can claim most of Red Tarn, which sits between Swirral Edge and Striding Edge. 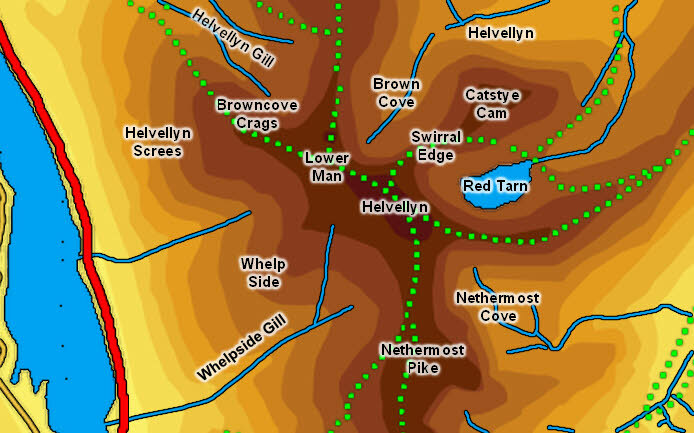 Three quarters of the tarn belongs to Helvellyn, and the remaining north-eastern corner to Catstyecam. The summit area is so large and so level (for a mountain top) that in 1926 John F. Leeming and Berk Hinkley successfully landed an Avro 585 Gosport biplane close to the summit and then safely took off! There is a small memorial to their achievement near the summit. More modern aviation also plays a role on the mountain - in the spring of 2014 rocks to repair the Striding Edge are to be airlifted to the path.